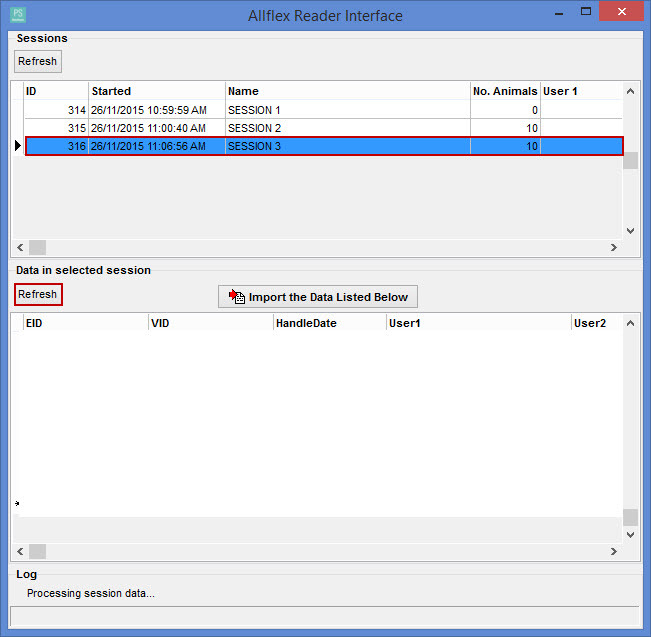 How do I import data directly from my Allflex Greenstick RS420? Note: your reader must be connected to Stockbook for this process to work. Click Here for help connecting the reader. 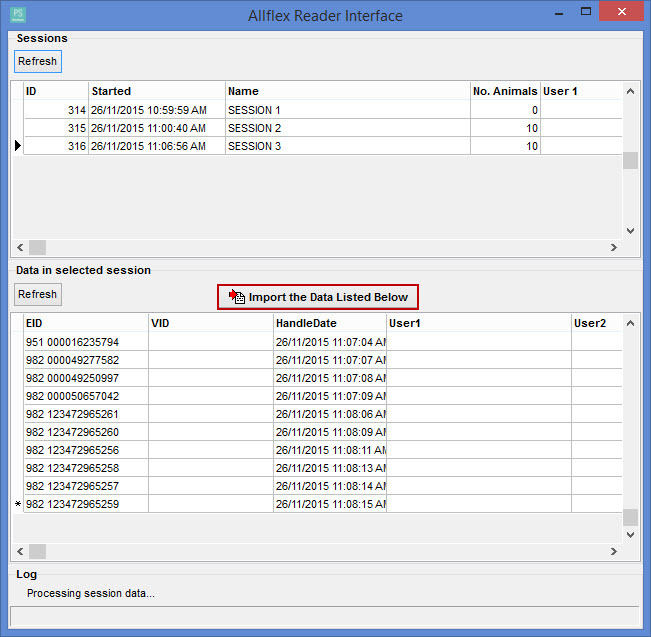 Once your reader is connected to Stockbook click on File > Import Options > Details From Data File. Select from the list the session you wish to import. then click Refresh. Once the selected animals from the session appear in the list click on Import this Data to bring the information into the import screen. You will then need to match up the appropriate fields so that you can bring in the information for the animals into Stockbook. This section allows you to customise how your data is imported. This tab gives you the ability to set a default Obs. Date, Obs. Code and Performance Management Group (Default Perf.Mgt.Grp) that will apply to every animal in the file. However, if in your .csv file you have a column for date or observation code, and you link them in step four then it is not necessary to use the default option. This tab is also used to set the Date Format and Add New Tags for new animals being imported onto a user list. NOTE: It is recommended that if you are importing weight or trait data that you include an observation code (Obs.Code) so that all records will have the same codes unless otherwise specified. NOTE: If the Add New Tags box is not ticked and the animal being imported is not on file then an error will be generated and the new tags will not be added to your Stockbook. 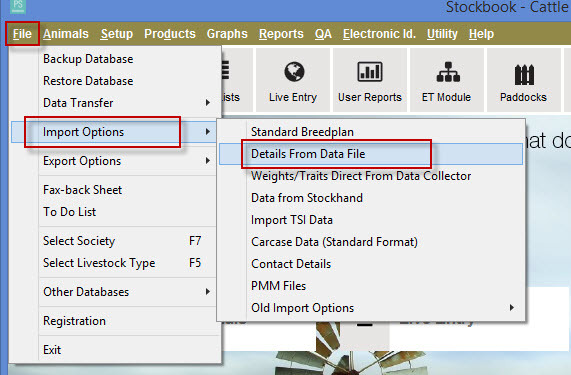 Here you need to select the Data Type then the Stockbook Field for the fields that you want to import. NOTE: You do not have to import all the fields contained in the Source Name column or CSV File Heading. Select the Data Type from the drop down list. This example shows Primary Id being linked to Life Data. If the Stockbook Field does not show the correct link, you may have selected the incorrect Data Type. Repeat Steps 1,2 & 3 for each CSV File Heading that you wish to import. Click on the Save this Layout button. This will save all the linked fields for the next time you import data. This layout can be found in Step 2 on the Import Screen for Animal Details From Data Collector File.